In a much anticipated Hero I-League match between Aizawl FC and Bengaluru FC, the final whistle blew with a 1-1 tie with both goals scored in the first half within a span of 5 minutes by Brandon and Chhetri. Brandon Vanlalremdika (40′) opened the goalmouth whereas Sunil Chhetri (45′) cancelled the home team’s lead at the stroke of the first half. Meanwhile, this goal added another feather in the talismanic striker’s hat as he leapfrogged Bhaichung Bhutia to score the most number of goals combining NFL & I-League. Bhaichung Bhutia had enjoyed the cushion until today with 89 goals. 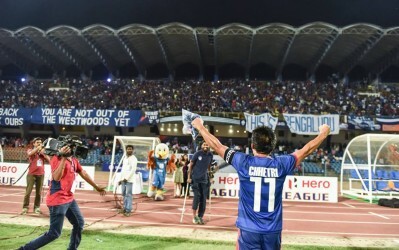 Bengaluru FC did no less scoring an equaliser just 5 minutes later when captain Sunil Chhetri received the ball and shot it straight into the top corner of the box from about 30 yards away. The half time ended with the 1-1 tie. Aizawl FC looked the better team in the first half with 3 shots on target while the away team had a single shot on target. Away keeper Amrinder Singh also saved his team in the 32nd minute when he successfully blocked a powerful shot by Alfred Jaryan moments after Al-Amna’s header hit the bar. Hero I-League has always drawn a large crowd of ardent football fans in Aizawl, and today’s match too saw a great number of spectators. The second half kicked off again to a vibrant start. Bengaluru FC missed their chance to lead in the 55th minute when Sunil Chhetri stepped up to take the penalty which was punched away by Aizawl FC keeper Albino Gomes. Gomes now claims two penalty saves this season, earlier came when he denied Fabio Pena in their home match against Shillong Lajong. 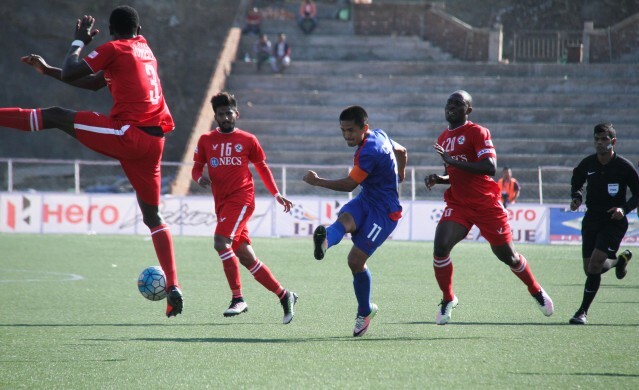 Aizawl FC maintain their enviable unbeaten record at their home in the ongoing season. Though Bengaluru FC halted their four matches winning streak at their home, the highlanders would be happy with the solitary point earned from today’s tie. Aizawl FC keeper was declared the Hero of the Match for his splendid blocks. Aizawl FC still are third in the table with 17 points from 9 matches with Kingfisher East Bengal and Mohun Bagan above them. Bengaluru FC remain stranded at the fifth spot with 12 points playing one match less. Bengaluru FC will be heading to Mumbai for their next match while Aizawl FC will start preparations to take on Kingfisher East Bengal on February 20, 2017.